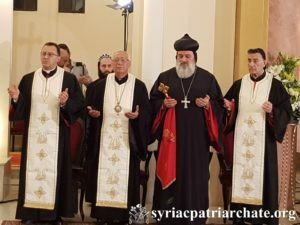 On March 9, 2019, His Holiness Patriarch Mor Ignatius Aphrem II attended the Holy Qurobo celebrated by His Beatitude Mor Ignatius Joseph III Younan, Syriac Catholic Patriarch of Antioch, at the Lady of Annunciation Cathedral in Beirut, for the occasion of the feast of Mor Aphrem the Syriac according to the Syriac Catholic Calendar. The Qurobo was also attended by their Beatitudes Cardinal Mor Bechara Boutros Rai, Maronite Patriarch of Antioch and All the East, and Joseph Absi, Greek-Melkite Patriarch of Antioch and All the East, Alexandria, and Jerusalem, as well as Their Excellencies Mgr Joseph Spiteri, Apostolic Nuncio in Lebanon, and Archbishop Makar Ashkarian on behalf of His Holiness Catholicos Aram I of the Great House of Cilicia. Their Excellencies: Minister of Displaced Ghassan Atallah, Member of the Parliament Antoine Pano, and Dr. Daoud Sayegh, on behalf of their Excellencies: General Michel Aoun, President of the Lebanese Republic, Nabih Berri, Speaker of the parliament of Lebanon, and Saad Hariri, Lebanese Prime Minister, respectively. His Holiness was accompanied by their Eminences Mor Theophilus Georges Saliba, Archbishop of Mount Lebanon and Tripoli, and Mor Maurice Amsih, Archbishop of Al Jazeerah and Euphrates, as well as Very Rev. Raban Joseph Bali, Patriarchal Secretary and Media Office Director. At the end of the Qurobo, His Holiness offered greetings to His Beatitude Patriarch Younan for the occasion, and asked the intercession of Mor Aphrem the Syriac for the Holy Church of God. On Saturday 9, 2019, His Holiness Patriarch Mor Ignatius Aphrem II presided over an advisory session concerning the situation of our church in India and the situation of the Knanaya Archdiocese, at the Patriarchal Residence in Atchaneh, Bikfaya – Lebanon. Their Eminences who were present in the episcopal consecration of Mor Anthimos Jack Yacoub, namely: Mor Theophilus Georges Saliba, Archbishop of Mount Lebanon and Tripoli, Mor Dioscoros Benjamin Atas, Patriarchal Vicar in Sweden, Mor Selwanos Boutros Al-Nemeh, Archbishop of Homs, Hama, Tartous and Environs, Mor Athanasius Elia Bahi, Patriarchal Vicar in Canada, Mor Justinos Boulos Safar, Patriarchal Vicar in Zahleh and Bekaa, Mor Gregorius Malke Urek, Patriarchal Vicar in Adiyaman and its Environs, Mor Clemis Daniel Kourieh, Archbishop of Beirut, Mor Dionysius Jean Kawak, Patriarchal Vicar for the Archdiocese of the Eastern United States of America, Mor Chrysostomos Mikhael Chamoun, Patriarchal Vicar and Director of the Patriarchal Benevolent Institutions in Atchaneh, Mor Nicodemus Daoud Sharaf, Archbishop of Mosul, Kirkuk, Kurdistan and Environs, Mor Timotheos Matta Al-Khoury, Patriarchal Vicar in the Patriarchal Archdiocese of Damascus, Mor Timotheos Matthew, Mor Georges Kourieh, Patriarchal Vicar of Belgium, France and Luxemburg, Mor Maurice Amsih, Archbishop of Al-Jazeerah and Euphrates, participated in the session. His Holiness inaugurated the session with a prayer in which he asked the guidance of the Holy Spirit for the fathers. The Church Fathers discussed the situation in the Church in India, especially the recent developments in the Knanaya Archdiocese. On March 9, 2019, His Holiness Patriarch Mor Ignatius Aphrem II celebrated the Holy Qurobo at Mor Severus Church in the Patriarchal Residence in Atchaneh – Bikfaya, Lebanon. During the Qurobo, His Holiness consecrated Very Rev. Raban Jack Yakoub as Archbishop, Patriarchal Vicar for the Youth affairs and Religious Education. His Holiness was assisted in the Qurobo by their Eminences: Mor Dioscoros Benjamin Atas, Patriarchal Vicar in Sweden, Mor Athanasius Elia Bahi, Patriarchal Vicar in Canada, Mor Nicodemus Daoud Sharaf, Archbishop of Mosul, Kirkuk, Kurdistan and Environs, and Mor Timotheos Matta Al-Khoury, Patriarchal Vicar in the Patriarchal Archdiocese of Damascus. Their Eminences: Mor Theophilus Georges Saliba, Archbishop of Mount Lebanon and Tripoli, Mor Severius Malke Mourad, Patriarchal Vicar in Brazil, Mor Selwanos Boutros Al-Nemeh, Archbishop of Homs, Hama, Tartous and Environs, Mor Justinos Boulos Safar, Patriarchal Vicar in Zahleh and Bekaa, Mor Gregorius Malke Urek, Patriarchal Vicar in Adiyaman and its Environs, Mor Clemis Daniel Kourieh, Archbishop of Beirut, Mor Dionysius Jean Kawak, Patriarchal Vicar for the Archdiocese of the Eastern United States of America, Mor Chrysostomos Mikhael Chamoun, Patriarchal Vicar and Director of the Patriarchal Benevolent Institutions in Atchaneh, Mor Timotheos Matthew, Mor Georges Kourieh, Patriarchal Vicar of Belgium, France and Luxemburg, Mor Maurice Amsih, Archbishop of Al-Jazeerah and Euphrates, also assisted His Holiness in the consecration rite, in the presence of His Eminence Mor Philoxenus Matta Chamoun. Their Beatitudes Mor Ignatius Joseph III Younan, Syriac Catholic Patriarch of Antioch, and Joseph Absi, Melkite-Greek Catholic Patriarch of Antioch and All the East, Alexandria, and Jerusalem, in addition to their Eminences and Excellencies Archbishops of the Christian Churches in Lebanon and Syria, and a crowd of the Very Rev. and Rev. priests, monks, nuns, deacons, and faithful. In his sermon, His Holiness recalled the story of the Forty Martyrs of Sebastia, whom the Church commemorates today. He considered that Christianity is the most persecuted religion in the world. He added that each one of us is a martyr (witness) for Christ, some by blood, others by words or deeds. Speaking about the consecration of a new archbishop, His Holiness said that today the Church presents a new martyr (witness) for Christ. The way of martyrdom, His Holiness added, is full of spiritual joy even despite all the troubles and hardship. At the end, he congratulated the new archbishop wishing him a fruitful service for the church, especially the youth. 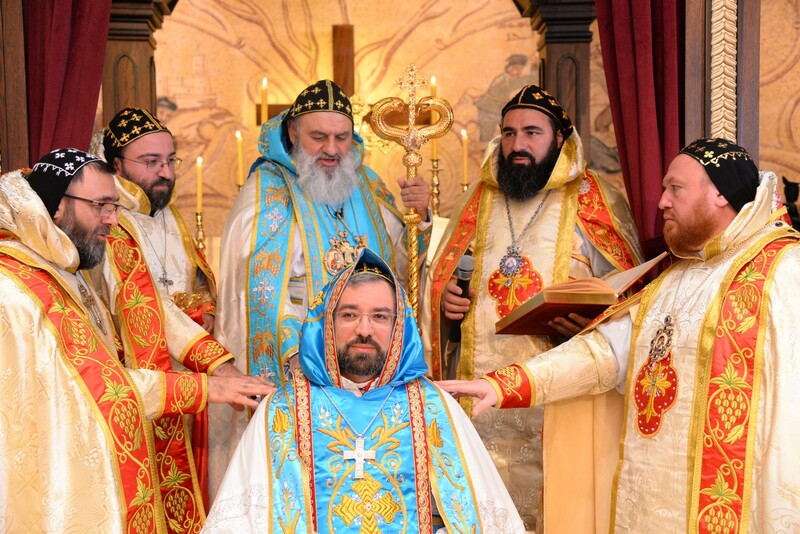 During the Qurobo, according to the rite of the Syriac Orthodox Church of Antioch, the new archbishop declared his Orthodox Faith and signed it before His Holiness the Patriarch. His Holiness prayed the prayer of the invocation of the Holy Spirit and the laying on of the hand. He laid on his right hand on the head of Raban Jack and ordained him as an archbishop. Then, His Holiness gave the new bishop his fatherly name (Anthimos), and started to put on him the bishopric vestments. The new bishop sat on the bishopric chair; His Holiness placed his right hand over the archbishop’s shoulder and declared thrice: “Axios (worthy)”, while the crowd of faithful repeated the same each time. The new bishop was then carried on the chair so he reads the special reading from the Holy Bible. At the end, His Holiness gave him the crosier (pastoral staff). After the Qurobo, His Holiness, their Beatitudes, His Eminence the New Archbishop, and all their Eminences, entered the Patriarchal Hall where His Holiness put on the new archbishop the turban and the black robe with red hems, and gave him the small staff. Congratulations were then offered to the new archbishop. On March 8, 2019, for the occasion of the sixty-years anniversary of devotional life of His Eminence Mor Theophilus Georges Saliba, Archbishop of Mount Lebanon and Tripoli, His Holiness Patriarch Mor Ignatius Aphrem II presided over the Holy Qurobo, which was celebrated by His Eminence in Mor Jacob of Serugh Cathedral in Sabtieh, Mount Lebanon. His Beatitude Mor Ignatius Joseph III Younan attended the Holy Qurobo along with their Eminences and Excellencies Archbishops representatives of the various Churches. His Excellency Amine Gemayel, Former Lebanese President, and their Excellencies Members of the Lebanese Parliament: Majed Eddy Abi Lama, Edgar Traboulsi, and Antoine Pano, as well as representatives of the formal body, and the Church organizations, in addition to a large crowd of faithful. In his sermon, His Holiness considered that the best way to celebrate is by being gathered around the table of the Lord. He spoke about the life of consecration, considering that “consecration is submitting one’s self for the service of the Lord; in this is the greatness of the Lord revealed, in choosing a normal man and making him a shepherd for His flock, servant of His Holy Mysteries, and steward on His household”. 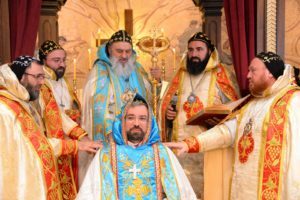 He added: “His Eminence Mor Theophilus Georges Saliba has consecrated himself for the service of the Lord and that of man, for one cannot fulfill the first without completing the latter”. His Holiness then described His Eminence and his love for the Holy Church, and steadfast faith, and defending the Church against all offenders. Their Eminences: Mor Theophilus Georges Saliba, Archbishop of Mount Lebanon and Tripoli, Mor Dioscoros Benjamin Atas, Patriarchal Vicar in Sweden, Mor Severius Malke Mourad, Patriarchal Vicar in Brazil, Mor Selwanos Boutros Al-Nemeh, Archbishop of Homs, Hama, Tartous and Environs, Mor Athanasius Elia Bahi, Patriarchal Vicar in Canada, Mor Justinos Boulos Safar, Patriarchal Vicar in Zahleh and Bekaa, Mor Gregorius Malke Urek, Patriarchal Vicar in Adiyaman and its Environs, Mor Clemis Daniel Kourieh, Archbishop of Beirut, Mor Dionysius Jean Kawak, Patriarchal Vicar for the Archdiocese of the Eastern United States of America, Mor Chrysostomos Mikhael Chamoun, Patriarchal Vicar and Director of the Patriarchal Benevolent Institutions in Atchaneh, Mor Nicodemus Daoud Sharaf, Archbishop of Mosul, Kirkuk, Kurdistan and Environs, and Mor Maurice Amsih, Archbishop of Al-Jazeerah and Euphrates, attended the Qurobo. His Holiness Patriarch Mor Ignatius Aphrem II received His Eminence Mor Nicodemus Daoud Sharaf, Archbishop of Mosul, Kirkuk, Kurdistan and Environs, at the Patriarchate Headquarters in Bab Touma – Damascus. His Holiness and His Eminence discussed matters related to the Church in Iraq. 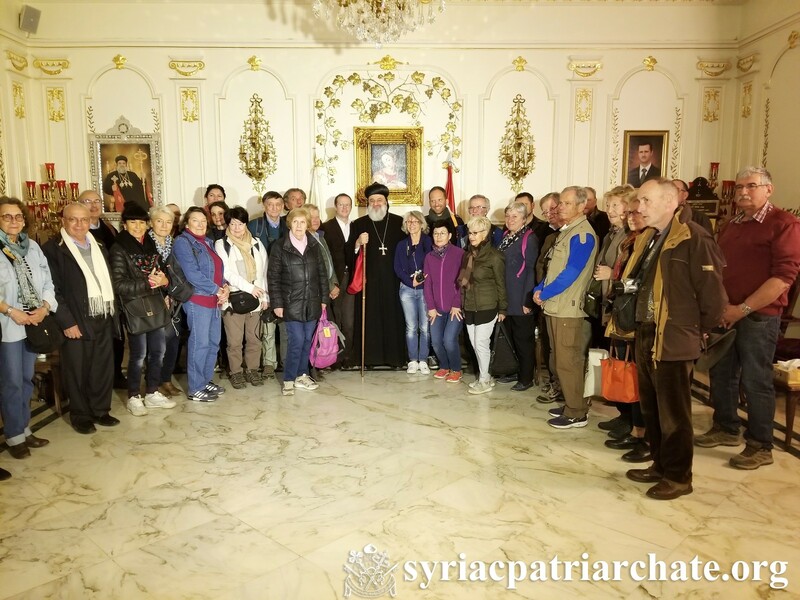 On March 6, 2019, His Holiness Patriarch Mor Ignatius Aphrem II received a delegation from SOS Chretiens d’Orient and a group of tourists from different western countries, at the Patriarchate Headquarters in Bab Touma – Damascus. In his word, as well as in answering the various questions of the delegation, His Holiness welcomed his guests and hoped they enjoy their stay in the country and get know the reality of the Syrian crisis. He stressed that what happened during the last eight years had nothing to do with the interests of the Syrian people; rather, it was only for the profit of agendas and power struggles. His Holiness hoped that the war is behind Syrians now. He assured that Syria needs a a strong government which gives the rights to all citizens and protects them equally. The New Syria, His Holiness emphasized, needs to ensure equal citizenship and respect to the religious and cultural diversity present in the society. He also remarked that Christians have been weakened a lot in Syria, but before in Iran, Turkey, and Iraq. His Holiness noted the importance of Christians’ presence in the Middle East for all the components of the societies, for Christians are always peacemakers. This, His Holiness added, made the Church strengthen her institutions, and this is why the Patriarchate is executing projects in order to provide job opportunities, not only for Christians, but for all the components, for the Church always promotes good relations, and because this is an investment in the future of Christians in the Middle East, which is only possible through co-existence. He also spoke about Antioch Syrian University and its role in this regard. His Holiness added that the abduction of the two archbishops of Aleppo Mor Gregorius Youhanna Ibrahim and Boulos Yaziji, as well as other priests and Christian figures, aimed at targeting the Christian presence. This was also revealed through terrorist attacks against several Christians villages and regions. On March 5, 2019, on the occasion of the visit of His Eminence Cardinal Luis Antonio Tagle, Archbishop of Manila and President of Caritas Internationalis, His Holiness Patriarch Mor Ignatius Aphrem II received His Beatitude Mor Ignatius Joseph III Younan, Syriac Catholic Patriarch, along with His Eminence Cardinal Tagle, and His Eminence Cardinal Mario Zenari, Apostolic Nuncio in Damascus, at the Patriarchate Headquarters in Bab Touma, Damascus. His Eminence Mor Timotheos Matta Al-Khoury, Patriarchal Vicar in the Patriarchal Archdiocese of Damascus, Very Rev. Fr. Youhanna Saroukhan, and Deacon Imad Syryany, attended the meeting. 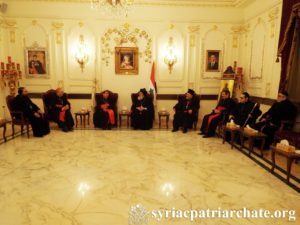 The delegation was accompanied by Monseigneur Thomas Habib, Secretary of the Apostolic Nunciature in Damascus, and Rev. Fr. Habib Mrad, Syriac Catholic Patriarchal Secretary. His Holiness welcomed his guests, and expressed his happiness to receive His Eminence Cardinal Tagle in Syria. 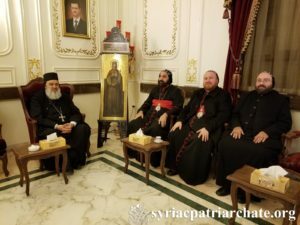 They all discussed together the general situation in Syria and the Middle East, as well as the humanitarian work of the Church and Church organizations for the relief of all people living in trouble. His Holiness and his guests also spoke about the good ecumenical relations between the Syriac Orthodox Church and the Catholic Church, and looked forward for complete communion and full unity. 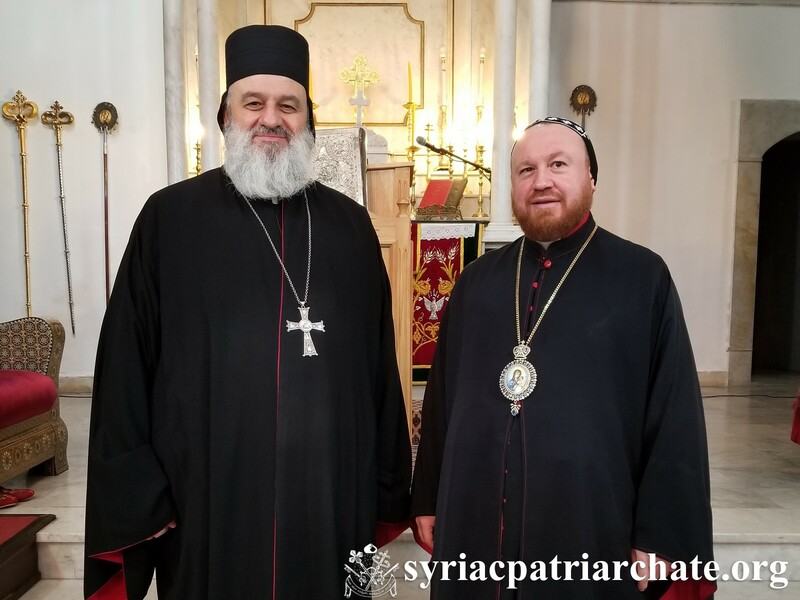 On March 5, 2019, His Holiness Patriarch Mor Ignatius Aphrem II received His Beatitude John X, Greek Orthodox Patriarch of Antioch and All the East, at the Patriarchate Headquarters in Bab Touma, Damascus. His Eminence Mor Timotheos Matta Al-Khoury, Patriarchal Vicar in the Patriarchal Archdiocese of Damascus, and Very Rev. Fr. Youhanna Saroukhan, attended the meeting. His Holiness and His Beatitude discussed the general situations in Syria and the Middle East, as well as common Church matters. 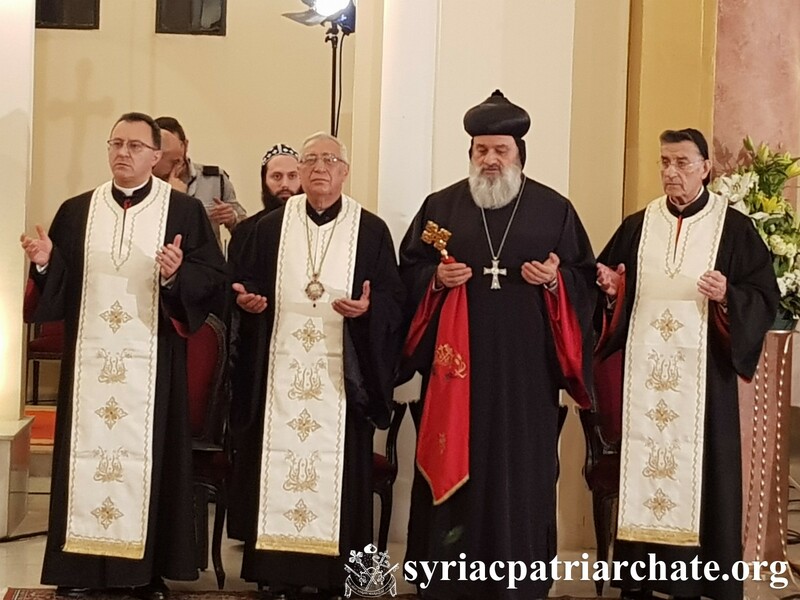 On March 4, 2019, His Holiness Patriarch Mor Ignatius Aphrem II received a delegation from the national reconciliation in Homs, at Mor Aphrem Monastery in Maarat Saydnaya in Rif Dimashq. The delegation consisted of Christian and Muslim Leaders from Homs. It was led by His Excellency Sheikh Issam Al Masri, Director of Homs Endowments, and Dr. Mohammad Khaddour, President of the League of Tourism Chambers in Syria. 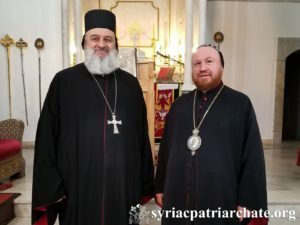 The meeting was attended by their Eminences Mor Timotheos Matta Al-Khoury, Patriarchal Vicar in the Patriarchal Archdiocese of Damascus, and Mor Selwanos Boutros Al Nehmeh, Archbishop of Homs, Hama, Tartous, and Environs, in addition to a number of the Rev. priests and Monks. His Holiness welcomed his guests and discussed with them the general situations in the country. He praised their efforts in spreading the culture of love and tolerance in Homs, and looked forward for the day in which peace reigns throughout Syria. The delegation thanked His Holiness for his overwhelming welcome. They expressed their appreciation to the humanitarian and national positions of His Holiness. They also thanked him for his kind invitation. His Holiness and the delegation, then, made a tour in the Monastery’s facilities, including Sayfo Martyrs’ Altar, Grotto of the Lady of the Holy Girdle (Zunoro), and the Great Patriarchal Halls of Mor Aphrem. After that, they all moved to Antioch Syrian University (ASU), where they were received by Dr. Rakan Razzouk, President of ASU. His Holiness and the delegation made a tour in the university and were informed about the various departments and programs offered. The delegation then visited the different projects being executed by the Syriac Orthodox Patriarchate in Saydnaya, namely Melkart Pharmaceutical Factory, Little Angel’s House Orphanage, and the Holy Cross Monastery. A banquet was then offered by the patriarchate in honor of the delegation.